What We Do at Learning Sites, Inc.
LEARNING SITES designs and develops interactive 3D digital models that are based on actual archaeological evidence and that are reconstructed with an accuracy and sensitivity to known details that reflect the highest standards of scholarship. We integrate archaeological data with advanced computer graphics techniques to further education, data analysis, and the preservation of cultural heritage information. 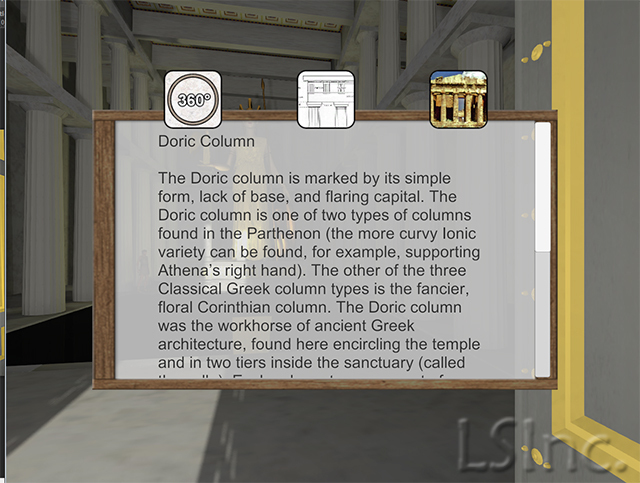 Our vision is to create a globally integrated and interactive system of linked virtual worlds that can be used for teaching, research, archaeological fieldwork, museum exhibitions, publication, social media, and tourism. Since the past happened in 3D, we should be using 3D re-creations of the past to learn better about the events, peoples, and places of the past. Through judicious use of current and emerging technologies, we can preserve our cultural heritage not just in two dimensions but in full and accurate three dimensions, so that knowledge of the past can continue to educate, inform, and excite present and future generations. Three-dimensional digital databases are dynamic media that can promote awareness of past civilizations, understanding of different cultures, and appreciation of different places, peoples, and their cultural development. Computer technology can reunite elements from disparate locations into a single model, creating a near first-hand experience of an ancient world in its original complexity. When those elements are linked to text and image databases--as in LEARNING SITES virtual worlds--the user learns about history, construction, decorative arts, or daily life with a click of the mouse. 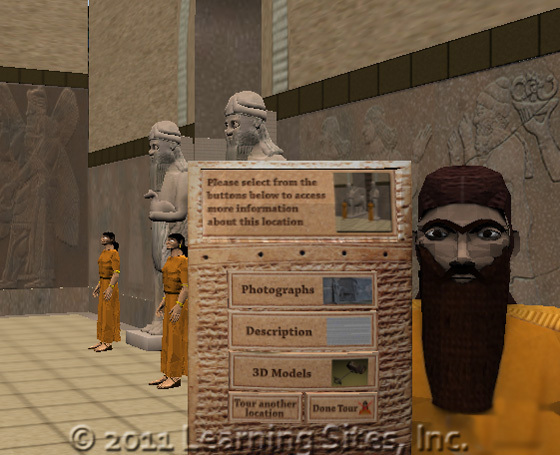 LEARNING SITES offers products and services employing virtual worlds as teaching tools, research aids, hypothesis testing environments, museum exhibition enhancements, archaeological site interpretation center displays, and global information banks. LEARNING SITES is always developing new and improved methods for accurately recording and reconstructing sites and monuments as digital and multimedia records. These records not only extend the life of the original documentation and preserve cultural heritage information but also, being digital, can today become immediately accessible globally and equally by educators, researchers, and students. Offering vicarious first-hand experiences otherwise beyond their reach or their school's ability to provide (as they travel through space and time). Providing interaction with geographically or temporally remote locations, people, or objects (in the world or via embedded social media links). Providing information at levels of detail tailored to individual needs and meet curriculum guidelines and standards. Schools will find the immersive future classroom financially efficient as well. With access to online teaching materials, each school system need not compile complete sets of instructional materials or full libraries, in the traditional sense. With worldwide connections, a virtual environment will (utilizing Web 2.0 social network tools and a myriad of digital devices) connect students voice-to-voice and eye-to-eye with peers and the best instructors and teaching aids across in the globe. What LEARNING SITES envisioned and wrote about 20 years ago is now becoming a reality. For archaeologists, we build new publication and reporting formats in which virtual worlds become the 3D visual indexes to all the (text, image, and tabular) data. Embedded and interlinked 3D indexex offers unparalleled flexibility, allowing access to information either linearly, via conventional text-based browsing, or nonlinearly, via image queries or interactively, via virtual tourguides and in-world characters. Enlarging this picture further, we envision that not only education and the tourism industry will benefit but also (as we have been predicting for 20 years)that archaeology itself will become radically changed. Born digital documentation and recording methods allow fieldwork results to be entered directly into bi-directional databases as excavation progresses. Field archaeologists are able to access virtual worlds created automatically during excavation, as well as feeding new data into the system, which automatically updates and feeds into online teaching aids. Thus, eventually, architects, archaeologists, artists, engineers, educators, computer technicians, software designers, and telecommunications experts will collaborate in constructing multidimensional libraries that will become the foundations of the envisioned globally accessible interactive virtual environments. 1989-1994 - some early projects developed under the leadership of Bill Riseman (to access these projects click on the images below).